This pop up 'castle' shape lends itself to producing pop up mailers resembling castles, towers, "ton weight" and chocolates shaped like "Munchies". The Pop Up Castle has four trapezium-shaped walls which give the product its unique castle shape. These walls offer a large area for promotional print which makes it a great candidate for use as a promotional idea for business marketing. 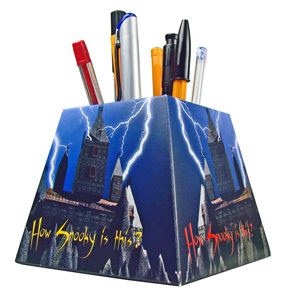 The base and top are both square and you can even have pen holes in the top creating a fairytale promotional pen pot pop up mailer. The shape is exactly the same as our Pop-up Choc Box only upside-down. The Pop Up Castle or Pop Up Chocolate box shape and size works to the benefit of the automatic pop up action and the product has a very strong “jump”. The pop up mailers go off with a quite noisy crack when their mailing envelope is opened and continue to have a strong action when used over and over. 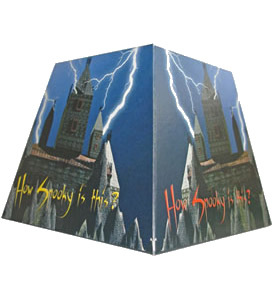 The promotional Pop-up Castle makes a terrific Halloween promotion when designed with "haunted castle" graphics, but a change of graphics can alter the Pop-up Castle entirely as you can see in the picture above. Whilst our own choice of design for this trapezium-shaped pop up mailer is as a chocolate box, the pop up shape can also lend itself to promotional printing as a shopping basket, a waste paper bin or a waste skip - though of course chocolates look much nicer! The shape is formed by its four trapezium-shaped walls which slope outwards to give the Pop Up Chocolate Box a generous area on the top as well as on the sides for your promotional print. The Pop Up Chocolate Box could be designed with promotional print as a wire shopping basket which might spark off some creative marketing ideas. These pop up mailers could be used as interactive promotional mailers for a supermarket chain or exhibition giveaways for a manufacturer of wire baskets or shopping trolleys for example. A glance at the shelves in your supermarket will tell you that this kind of shape has been adopted by many manufacturers of confectionery as an attractive shape for their retail packaging. Anyone looking for a winning promotional idea needs look no further than this Pop Up Chocolate Box of “goodies”. The pop up shape gives off a very positive “vibe” as chocolates and sweets are always viewed as a treat or reward, so with the right creative marketing ideas this business communication product could make a very attractive popupmailer. Adding dates to the Pop Up Chocolate Box creating a promotional pop up calendar will also add life to the promotion. Adding a further use to the promotional product means it can stay on your customer’s desk for months.